Boost your testosterone, gain lean muscle mass and regulate your cholesterol with Tribulus Terrestris Extract from Biogreen Labs. 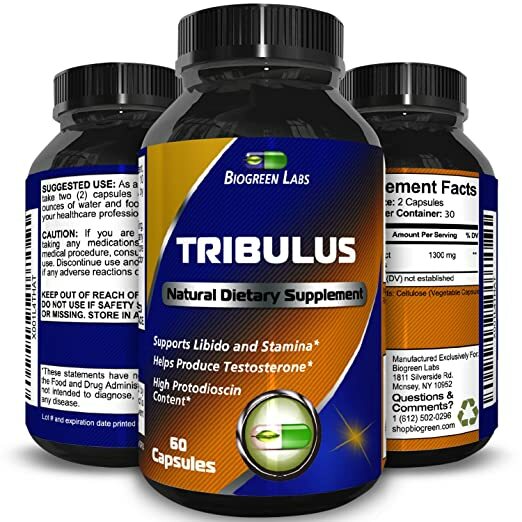 This supplement is naturally extracted from the flower of the tribulus, and is a natural and pure way to support increasing your testosterone levels. The flower itself is known by a few different names: Puncturevine, Goat-head, Devil’s Weed and Cat’s Head are just a few. And it can have incredible benefits, especially when taken in the form of a capsule that contains 45% saponins, which this product has – while the pills have a large 1300 mg doses of tribulus powder. As well as the body building benefits, this supplement will also help to lower triglycerides, fight loss of libido, enhance male sexual performance and reduce the amount of blood glucose in your system – which has definite health benefits. It can also improve the overall health of your heart, as well as helping to get rid of water weight and bloating thanks to its diuretic properties. Finally, you can use this supplement to support the wellbeing of your digestive system, as well as for things like headache relief. Take two capsules, once a day, with eight ounces of water and with food. This product is manufactured in the U.S.A under strict cGMP standards.